In Japan, the tradition of knotting is well known and remains much alive especially in wedding customs, gift-giving and wrappings, festive occasions, shrine and temple ritual contexts, agricultural practices. Children are still taught how to tie mizuhiki though it is no longer as well practised as the cat’s cradle. Mizuhiki is an ancient Japanese art form that uses a special cord. The cord is created from rice paper, that is tightly wound, starched to give it stiffness, and then colored. The ways of coloring include brightly colored Mylar (a very thin plastic), thin strands of silk, or simply painted. The art form was used to tie up the hair of the samurai. Currently there are several forms. The traditional decoration, given away at Japanese occasions, such as weddings, births, and funerals take the forms of animals or boats. Different animals are created for different meanings, including cranes, frogs, fish, dragons, and turtles are among the most popular. The other traditional way the art is done is in decorating cards with little colored knots, similarly to how people in western cultures use a ribbon and bow. A third way is being developed that uses the ancient art for a more modern purpose, jewelry. In 607 AD, a Japanese delegate returned from China with a gift for the Japanese emperor. The gift was decorated with a red and white twine knot symbolizing “safe journey” for the delegate. The Japanese began recreating the knot from washi, starting a tradition of presenting a gift box with a twine or Mizuhiki knot. Although the history of Japanese knotting is often attributed to Chinese contacts, knotting is known from earlier prehistoric Kofun (kurgan burial mound) times when patterns of intricate knots were carved on ritual rocks or funerary ceramic haniwa stands, suggesting a magical ritual and mythological context. musubi-matsu — the ritual of tying the branches of a pine tree (matsu) together in order to ensure the safe return of a group or individual embarking on a journey. turning to some actual definitions of the chinkon rite, we find the following explanation in the Ryo no gige under the heading chinkon: “The graph means to pacify. A person’s yang spirit (yoki) is called soul (tama). The tama moves about, meaning one summons back the tama that wanders about in a state of separation and pacifies it inside the body (literally “bowels”.] Therefore it is named “chinkon” (to pacify the soul), another definition from the Ryo no shuge contains some additional details: A person’s yang spirit is called ‘kon’ it moves about. A person’s yin spirit is called ‘haku’ it is white. Therefore one calls back the white soul wandering about in a state of separation and causes it to be pacified inside the bowels. Therefore it is called chinkon. The exact source for the ideas contained in these descriptions remains uncertain, but the language recalls ancient Chinese ideas about the fate of the soul after death. According to the Li ji: the yang qi of the “cloudsoul” (hun) rises up to the sky (tian) after death, whereas the yin or dark elements associated with the body or “whitesoul” (po) return to the earth. 55 Another passage in the Li Ji , on the rites of mourning , speaks of summoning back the cloudsoul and returning it to the body (po)56. It was under the influence of such commentaries, according to Watanabe Katsuyoshi, that modern scholars developed the idea of a “soul that wanders about in separation from its body” and interpreted chinkon as a rite primarily aimed at preventing such separation by placating the “tama” and thereby obviating the illness and death that were held to result from such separation57. The yin-yang five agents principles and the related concept of “qi” which informed the ritual setting (temporal and geomantic) of the chinkonsai and the descriptive language of the law doctors, were fundamental, of course to Chinese philosophical thought. In Daoism, the induction of qi into the body and its proper regulation became one of the basic practices for achieving longevity, a central concern of later Daoist literature, as in Xiang’er’s commentary on the Daodejing, which also functioned as a guide to the enlightened ruler.58 thus in Bokenkamp’s paraphrase of one Xiang’er passage “the pneumas of morning and evening should be caused to descend into the human body , where they should be mixed with the body’s own pneumas so that they are evenly distributed throughout.” On the other hand, this time citing directly from the Xiang’er “When the heart produced ill-omened and evil conduct, the Dao departs, leaving the sack (belly) empty. Once it is empty, deviance enters, killing the person.”60 As these citations make clear, teh principle of balacning and harmonizeing qu was of paramoutn importanecce; deviancce” (xie) on the other hand, arose from a a failure ot achieve a proper balance or mixing o pnemas resulting in illlness and death. … The emphasis in the Xiang’er passage on the belly, for example, recalls what Watanabe characterizes as the peculiar language of the law commentaries where the aim of the rite was to draw the erring “tama” back into the “bowel”. A related notion found in the Chuxue ji, a Tang period encyclopedia compiled at the order of Emperor Xuangzong (r. 712-756), states that on the winter solstice the yang qi is restored to the belly and hot things placed in qi are easily digested.61 If this Daoist medical advice offers a parallel to the ideas of the law doctors in their attempts to describe the chinkon rite, recipes for the production of immortality elixirs provide a suggestive context for understanding the relationship between the medicinal herb and Temmu’s spirit-summoning rite. An entry from scroll seventy-seven on “elixirs” in Yunqi qiqian (Seven Lots from the Satchel of the Clouds), an encyclopedia of older Daoist texts and extracts compiled under the Northern Song, describes a life-extending elixir called lingwan that allows one to “pacify the cloud souls, coagulate the white souls, and fly off into the seventy-four directions,” and in another passage “to sport about on the Five Mountain Peaks.” Not least interesting here is the combination of graphs chinkon, “pacify the cloud souls”) the same two graphs that are used for the Japanese chinkon or “mitama-furi” rite. Another entry from the Inner Transmission of the Purple Sun Master (Ziyang zhenren neichuan, 399), collected in scroll 106 of the Yunji qiqian, relates that the consumption of zhu over a period of five years–the same medicinal herb ingested by Temmu–produces a glow in the body, gives one a vision that can see right through to the five viscera, and enables one to become an immortal. More broadly, knots in cords, ropes, scarves were tied to bind magical power, and untied to release it, the actions accompanied by the chanting of spells while releasing the knots. Knots could be used to bind love towards someone or to prevent the affection from forming. Knots are used in India and Thibet as Talismans for Longevity and to avert the Evil Eye (see Illustration No. 27, Plate II), the Knot being considered potent to bind that which is good and precious, and to prove an obstacle or hindrance to that which is evil; for instance, at the time of marriage knots are lucky, and the ceremonies connected with a Chinese marriage include knotted red and green ribbons, which are held by the newly wedded pair, the bride holding the green ribbon whilst the bridegroom seizes the red; and in our own country the true-lover’s knot is frequently used in the decoration of the wedding dress; but at childbirth and death, there must be no knots about the person to hamper the coming or going of the spirit. When someone was dying, it was once a common practice to untie all knots within the room so as to not keep the dying person bound to life and suffering. The origins of the amulet are unknown. As a knot, however, its symbolism revolves around the idea of binding and releasing, the joining of opposites, and, since a knot secures things, protection. Knot magic was well known in Egypt from an early period; an inscription in one of the pyramids states, “Isis and Nephthys work magic on Thee (Osiris) with knotted cords.” The Book of Coming Forth by Day gives several examples of the magical power of the knot. In this one, knots are tied around the deceased to help her come into the presence of the Deities; “The four knots are tied about me by the guardian of the sky . . .the knot was tied about me by Nut, when I first saw Maat, when the gods and the sacred images had not yet been born. I am heaven born, I am in the presence of the Great Gods.” In addition to these four knots, there were seven knots, or tesut, that were tied about the decreased to protect him or her. The tiet appears in Egyptian iconography in the third dynasty. It was frequently used in association with the djed pillar of Osiris, and so became almost exclusively associated with Isis. Used together, the two symbols could refer to the power of the Goddess and God to engender Life. The ritual context and great ancient origins of the Gordion knot (known from Hittite texts) out of Anatolia is explained in B.W. Burke, “Anatolian Origins of the Gordian Knot Legend,” 2002 Greek, Roman and Byzantine Studies 42, 255-261. ‘Mitti’or ‘mita’ means red twisted cords or threads and Gordios was a Phrygian king according to the book. Loops of red, black and white wool are mentioned and the rituals are tied to the Zeus Temple and Indo-European or Aryan storm god. The Phrygian dynasts had a ritual based on a Hittite predecessors’. The ultimate origin of the story is from the period of the Hittite kings of central Turkey. The witches garland is a rope tied into a garland that is used for casting curses.With every knot that is tied, a curse is repeated and a black feather stuck into the garland. For best effect, the garland was to be put beneath the victim’s mattress. Knot weather gods were believed to tie or bind the winds. Fate Goddesses who where associated with the magickal tying and loosening of knots. The Triple Fate Goddesses of the Norse and the Norns are fate goddesses as well. These goddesses were able to use knots to tie up or release energy. Special cords are sometimes presented to initiates for use in ceremonies and magick. These cords are worn around the waist until needed during a ritual. Some groups weave these cords temporarily together during a ritual for spell work. However, most cord and knot magick is done with smaller, more flexible cords or thread. A well known funerary knot was the Walknot and its variants — the trefoil knot and Boromean triangles and Boromean links. Also known as Odin’s triangle’, ‘Walknot’ held the meaning of the knot of the slain. For more on the significance and meaning of the Walknot, see Blood & Honour – the Death Knot. These motifs are common in Japan on tumuli wall murals and on funerary earthen stands called haniwa of the Kofun burial mound period, and as well as etched carvings on large sacred rock. “Regardless of the method you choose to call the wind, make sure your hair is unbound and loose; binding and knotting are ways to capture the wind, not call it. There is a suggestion that this expression derives from the nets of knotted string which supported beds prior to the introduction of metal-sprung bedframes. The theory goes that, in order to make a marriage bed, you needed to ‘tie the knot’. Like many such folk-etymological explanations, there’s not a shred of evidence to support this idea. Francis Grose, in his 1811 edition of The Dictionary of the Vulgar Tongue listed the ‘knot tied with the tongue’ with specific reference to marriage. “During a woman’s labor it was custom in many cultures worldwide to undo all knots within the house. In black magic, knots can be used to hinder or stop the birth of a child, killing both the mother and infant. It was also believed that a knot can cause a painful and difficult delivery. Red wool thread with nine knots was sometimes worn by children to protect them from fever. A cord with 40 knots might be kept as an amulet for protection against thieves. Knots were also believed to be a repository of magical power or power of the gods. Roller, L. E. 1984. “Midas and the Gordian Knot,” Classical Antiquity 3, 258-271. 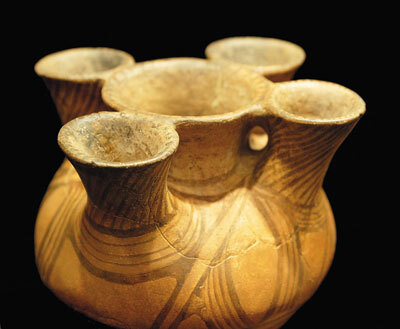 The Cucuteni culture is not of Ukraine but of Romania. The name of this civilization was conventionally established by archaeologists, according to the villages of Cucuteni (in Romania, near Iaşi) and Trypillia (in Ukraine, near Kiev), where, by the end of the 19th century, where there were for the first time discovered painted ceramics and fired clay statuettes – categories of items which became symbols of this ancient civilization. The Trypillia culture is from Ukraine. Romania and Ukraine are two different countries. 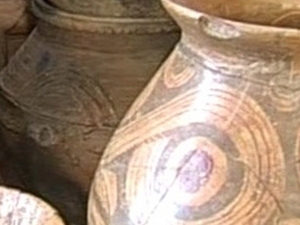 While I can understand modern-day countries wanting to “own” the associated artifacts and finds, hence the need for more precise terms, I mean, however, to apply them to the traits, symbols and iconography common to the broad cultural swathe that has been identified as the Cucuteni-Trypillian culture encompassing all three countries, Romania, Moldova and the Ukraine, and which has offered up as such by anthropologists and scholars as such…http://en.wikipedia.org/wiki/Cucuteni-Trypillian_culture. Also the photos are attributed to the gov. Of Ukraine. It is beyond the scope of this article to examine in depth distinctions between the different countries, but suffice to note a possible early and ancient connection and movement or diffusion of these traits and influences from the Ukraine (nearest point) via the steppe lands eastwards towards East Asia. We have also noted elsewhere other similarities such as the use of cross-finials in roof architecture of shrines in common between Japan and C-T culture, as suggested by the ceramic shrine models (also relic styles in Lithuanian roofing-architecture).